Last week, Janie and I took a mini day-trip to catch the new American Girl movie, An American Girl: Isabelle Dances into the Spotlight. It was debuting in Lynnwood at the Alderwood Mall, which is also where the American Girl store lives, so we made day of it with Janie’s American Girl-loving cousin, Taylor, and her mama. We actually started with lunch at the American Girl Bistro. If you have a little girl, whether she is obsessed with American Girl or not, this is worth doing. We’ve been a few times over the years and the girls always look forward to it… and I confess that I do, too! You can bring your own doll, or borrow one from their extensive collection (they give each doll a little booster seat to sit at the table with you), the food is surprisingly good and the prices are reasonable. I would recommend that you wait until your girls are old enough to actually enjoy the experience, as it can be overwhelming. I mean, imagine an entire cafe filled with doll-loving girls, half of which are celebrating their birthdays and most of which are hopped up on the bistro’s yummy pink lemonade. Meg was five when we took her for the first time and I’d say it was the perfect age to introduce her to the experience. Also, be sure to make reservations in advance. They are always booked and always busy. 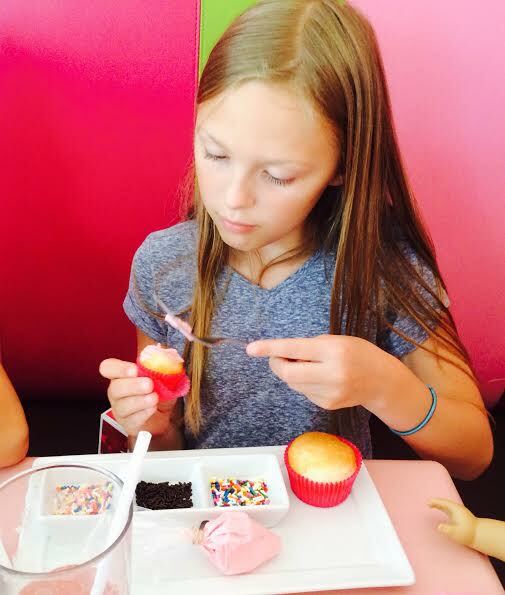 You can find more details about booking a reservation and the dining experience on the American Girl website. After lunch (and a little shopping at the American Girl store, of course! ), we headed over to the theater for the movie. An American Girl: Isabelle Dances into the Spotlight was so sweet, maybe my favorite of their movies yet (yes, I’ve seen them all…). I loved that it’s focused around Isabelle (who is the American Girl Doll of the Year for 2014) and her sister, Jade, who are both ballerinas. If you’ve seen enough of these movies, you know that the message from movie-to-movie is pretty much the same, but the girls don’t seem to mind, as they introduce new elements to bring each year’s Girl of the Year to life. Janie and Taylor both loved the movie… Janie, who spent years in ballet, was especially enamored and I could tell she was relating to the story and the characters. And, bonus points to American Girl for putting on a flawless event — the tickets to the movie were $5 each, but they included popcorn and soda at the theater, plus crafts, games and a gift bag for each girl (we snagged one to bring home to Meg, too!). It was all very well done. An American Girl: Isabelle Dances into the Spotlight goes on sale today. You can grab it on Amazon on DVD, Blue-Ray or via digital download. I don’t think that it’s sold locally in stores, but if I happen to see it, I’ll pass the information on. You can also get a copy at the American Girl store or one their website. Did you go to the premiere, too? 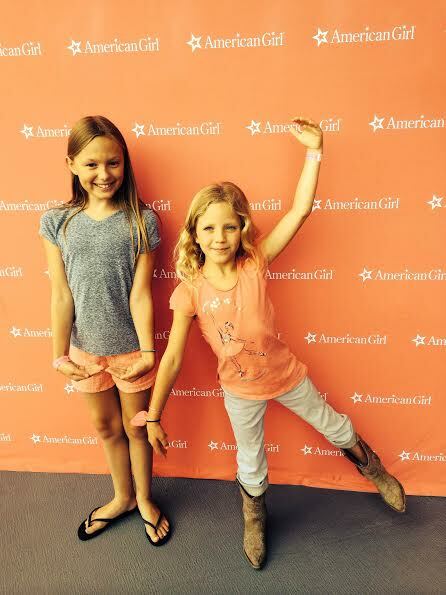 This entry was posted in Life and tagged American Girl, Movies on July 22, 2014 by Katie Kavulla.